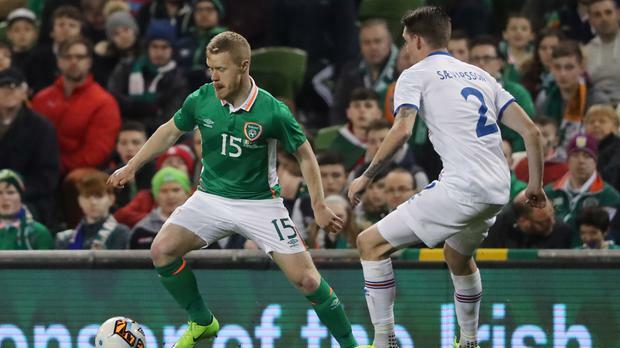 Daryl Horgan is hoping a dream 18 months is only going to get better as he attempts to muscle his way into the Republic of Ireland's World Cup party. The 24-year-old was handed a senior international debut as a substitute in Tuesday night's 1-0 friendly defeat by Iceland to cap a remarkable rise to prominence. Galway-born Horgan was one of the stars of Dundalk's extended European campaign earlier this season as the Airtricity League champions reached the group stage of the Europa League, his performances helping to win him a January move to Sky Bet Championship Preston. However, with his current employers pressing for a place in the end-of-season play-offs as the carrot of promotion to the Premier League dangles before them and international recognition having come his way, he is not yet satisfied. Asked if he can yet reach another level, Horgan said: "You have to aim for that, that has to be the plan. You can't rest on your laurels and say, 'I'm happy' at any level. "The top players never do that. I'm obviously not one of the top players, but you have to strive to be as good as you possibly can be and that's my aim. "Obviously I want to play at the highest level I can, whatever that may be - I suppose we'll find out at the end of my career. But I am enjoying it now and I am just going to keep working hard. "You just try to keep doing what you can, keep playing every game as it comes and at the minute, it's been going quite well. It's been a brilliant 18 months, so long may it continue." Horgan's adventure reached it's latest peak 63 minutes into Tuesday night's game at the Aviva Stadium when, as Ireland boss Martin O'Neill cast an eye over his fringe players, he sent the midfielder on in a green shirt for the first time. He said: "A chance to play for your country, it's unbelievable. It's a once-in-a-lifetime opportunity to make your debut. "Hopefully I can stay in the team, stay in the squad and hopefully we can qualify for Russia. If I can play any kind of part in that, it would be special." Horgan was one of four men to make his senior Republic debut in the game with club-mate Andy Boyle joining him from the bench after Brentford defender John Egan and Aston Villa midfielder Conor Hourihane had been handed starts. For Egan, whose late father John won six All-Ireland football titles, it proved to be an emotional evening. He said: "He would have been proud. It's a night you would have missed him a bit more because you would have loved to see him here. The rest of my family were here and I think they enjoyed it." Egan, 24, endured a rude welcome to the big stage when he was left with a cut head after an early clash with Iceland frontman Kjartan Finnbogason, but despite conceding the free-kick from which Hordur Magnusson won the game, he warmed to his task and like Horgan, was later mentioned in dispatches by O'Neill. The manager will hope to have some of his wounded troops back - skipper Seamus Coleman apart - when the squad reconvenes ahead of June's World Cup qualifier against Austria, but Egan too is hoping he has given him something to think about. He said: "I think I did all right. I could've done a bit better, but it was my first game. I have to keep the head down now and try to get into future squads." Pat Spillane League form rarely lies, so the recently completed competition is a reliable guide to what may transpire in the championship this summer.